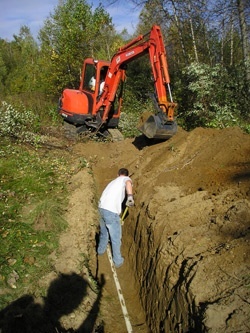 Don’t have a septic system? Have a town or city sewer? Remember, as a homeowner with town/city sewer you are responsible for the portion of the sewer pipe from your home to the property line. If something goes wrong on your side of the boundary line, it is your responsibility to repair your portion of the sewer pipe. Rowell’s trenchless pipeline repair/replacement is a cost-effective solution for your repair. To decide if this is the best solution for you, ask us to assess the problem, we will help you decide the more economical solution for your repair. We also offer homeowner financing options. TRENCHLESS RELINING YOUR SEWER PIPE CAN SAVE YOU TIME, MONEY, AND YOUR SANITY. 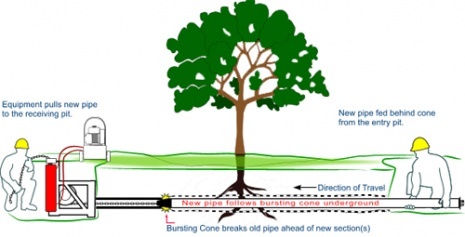 “Trenchless” means we can repair broken or leaky underground pipes without disturbing the ground (see diagram above). It’s cost-effective, and our cured-in-place pipe (CIPP) solution allows for simple pipe repair projects without damaging gardens or lawns. Cured-in-place pipe (CIPP) system creates a protective, structural pipe inside the existing host pipe system– all without digging up your lawn or garden. This seamless, joint-less, pipe-within-a-pipe is used to restore deteriorating septic systems and sewer lines (including mechanical systems). This technology is best suited for a pipe that is two inches to twenty-eight inches in diameter.